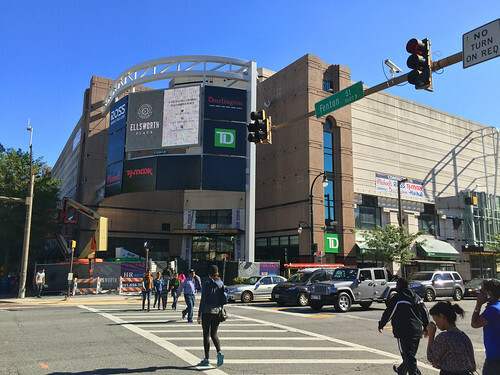 The revitalization of downtown Silver Spring has been going on for over a decade, but it seems like momentum has really picked up within the past year. No less an authority than Bethesda Magazine even called Silver Spring "Montgomery County's version of Brooklyn," noting all of the awesome locally-owned business that have opened here in the past year, from record shops to microbreweries. Hanging out at Denizens. All photos by the author unless noted. 2) The transit center opens (very late) and the library opens (less late). 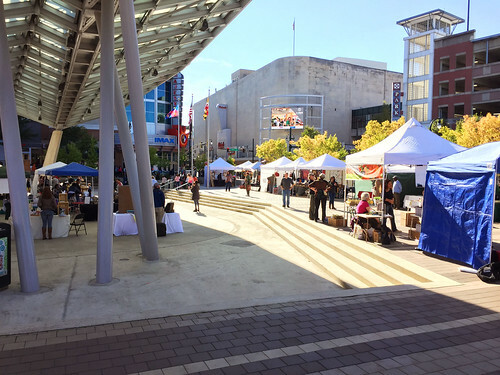 A big part of downtown Silver Spring's revitalization were new public buildings, which can both create community gathering spaces and attract private development. It only took 20 years, but the Silver Spring Transit Center is finally open without anyone getting hurt. (Now we can talk about what to do with the empty space around it.) And the Silver Spring Library opened this summer, giving downtown a new place to learn and hang out, even if it's a little boring. 3) Ethiopian explosion! Move over, Shaw: the heart of DC's Ethiopian community is now in Silver Spring, where the downtown area is now home to thousands of people of Ethiopian ancestry. And businesses have followed: white-tablecloth restaurants, sports bars, an "Ethiopian Chipotle," and of course, a half-dozen coffeehouses. Most impressive might be the transformation of Kaldi's Social House from a humble coffeeshop to a massive, multi-level space that draws folks well beyond the Ethiopian community. 4) Baby steps throughout East County. While downtown Silver Spring is booming, the rest of East County is moving along too. Wheaton is a little closer to getting its town center. Our friends in Forest Glen are leading the charge to reimagine the big parking lot at the Forest Glen Metro station. 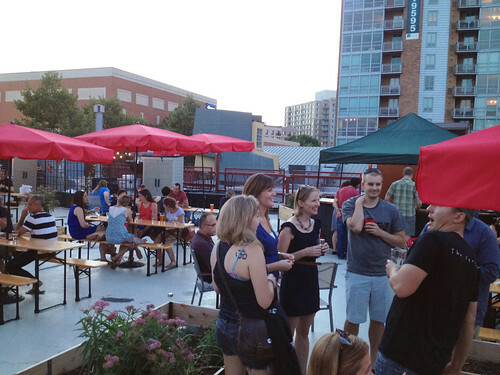 The folks behind hipster wonderland Union Market will work their magic on Burtonsville. And the White Oak Science Gateway got a new name, Viva White Oak (shudder) and an early Christmas present when the state approved a new Washington Adventist Hospital there. Miss you, Quarry House. 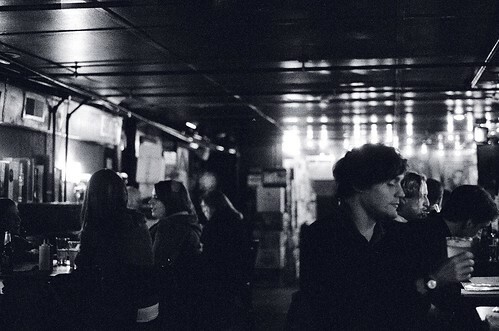 Photo by erin m on Flickr. 5) Saying goodbye (sort of) to some Silver Spring institutions. We lost a lot of local stalwarts this year. The Gazette newspapers folded in June (thanks, Jeff Bezos). Most of a block of Georgia Avenue between Bonifant and Ripley came down, and a 20-story apartment building will take its place (see #7). The infamous Piratz Tavern finally closed for good, but it turned out to be a blessing in disguise, becoming the temporary home of Quarry House Tavern when the 80-year-old bar had a big fire in March. Its neighbor and longtime Ethiopian coffeeshop Kefa Cafe (see #3) sustained some damage too, though we hear both will be back in their old homes early next year. And Pyramid Atlantic, the gallery and studio space that helped spark Silver Spring's revitalization over a decade ago, is heading to Hyattsville after plans to move it into the new library fell through. 6) MCPS gets a big shake-up. Want proof that elections matter? After Silver Spring's own Jill Ortman-Fouse was elected to the Board of Education last fall, MCPS superintendent Josh Starr saw the writing on the wall, realized he didn't have enough votes to keep his job, and abruptly resigned in February. While increasing segregation in the school system and a growing achievement gap between white and affluent and poor and minority students wasn't Starr's fault, his seeming indifference to growing complaints from East County parents and community leaders may have done him in. 7) The walls are rising. Downtown Silver Spring is experiencing its biggest building boom since the 1960s. In the past two years, over 1500 new homes have been built in the central business district, and more are on their way. Neighbors haven't always welcomed these new additions with open arms, as seen in the fight over the Chelsea Heights townhomes now being built on Ellsworth Drive. But literally dumping thousands of new residents on the streets of Silver Spring has been a boon for local restaurants and businesses. Ellsworth Place still under construction in October. 8) City Place - I mean, Ellsworth Place - finally turns around. I was four when City Place opened, but even I remember what a big deal it was supposed to be for a then-dead Silver Spring. It didn't quite work out. But with a new name, a new look, and new stores like TJMaxx and Dave & Buster's, what's now Ellsworth Place might have actually gotten something right. I did some last-minute Christmas shopping there and the mall was by no means packed, but it was busy. We'll see if things continue to pick up when the mall officially opens this spring. 9) The Purple Line might actually happen. I feel pretty good about it after Governor Hogan finally said yes this summer, but we won't know for sure until shovels hit the ground, probably in May. 10) There's actually nightlife now. Not that long ago, any life in Silver Spring after dark kept to the bright lights of Ellsworth Drive. But stand on Georgia Avenue on a weekend night, especially when it's warm out, and you'll quickly notice how noisy it is. Society's playing movies on their roof. The patios at Fire Station 1 and Denizens are packed. Urban Butcher's bar is serving fancy drinks on the sidewalk. It's not U Street yet, but nights in Silver Spring are definitely more happening than they used to be. Fenton Street Market in Veterans Plaza. 11) Taking community-building into our own hands. If you've been around Silver Spring this year, you've no doubt run into Pete Tan and Megan Moriarty, the minds behind marketing company Silver Spring Inc and craft market/occasional pop-up store Fenton Street Market, respectively. Both native to the area, Pete and Megan are two of the hardest-working people I know. Not only do their businesses promote the local economy, but they've organized everything from a Silver Spring PechaKucha night to a quarterly neighborhood tweetup. They're part of a growing class of young, motivated Silver Springers who aren't afraid to wear their love for this community on their sleeves. And there you have it: twelve very Silver Spring things that happened in 2015. Here's to an awesome year, and here's hoping we can do it even bigger and better next year. I'd argue that the SS Library was actually more late than the SS Transit Center in terms of number of total years it has been promised and not delivered - but I'll just let that issue quietly die now that we finally have BOTH! PS can we now focus on the blocked sidewalk due to construction at Fenton and Wayne - will peds never get a break on this corner? Hopefully Bombay Gaylord will rise from the ashes, and don't forget the great success that Adega seems to be experiencing too. What a great, inspiring list--thanks, Dan! Slightly more controversially for some, I'd add that Silver Spring put Free-Range Parenting on the map this year. Two Silver Spring parents let their kids play alone and walk home from a nice park, creating havoc among those for whom walking is a suspect activity. Thankfully, due to the persistence of the parents, the actions of the community, and the principled stand of local officials, kids will be allowed to play in a park, and walk home alone, without being arrested or subjecting their parents to charges of child neglect. A victory for common sense. Wheaton has a long way to go. The parking garage needs to come down. BRT needs to get dedicated lanes. And Costco needs to give up the gas station. Thanks for this FAB list. To remind us all. I moved away from Silver Spring two years ago but I am still very happy to see such excitement. As a native of Takoma Park who has lived in Indiana for the past 20+ years, I loved reading about the changes to the streets I roamed in my youth. The Quarry House holds particularly fond memories. Clearly, it's time for a trip back home! The name "viva white oak" makes me want to barf. Do you honesty believe the new library is boring? If so in what way? The review you linked to had few substantive criticisms - it mostly simply complained that it's not as good as the new DC libraries. And maybe that's true but that's not an argument against the library. Yes the entrances and circulation are terribly confusing, the Wayne Ave facade is a disappointment, and we'll need to see how the library looks and functions once the lower floor spaces are filled and the purple line is built. But it's a dramatic, iconic and dominating building inside and out.